Adria Arnaus will head into the final round of the Ras Al Khaimah Challenge Tour Grand Final with a three shot lead over a quartet of players after the Spaniard carded an impressive five under par 67 at AL Hamra Golf club to top the leaderboard for the third consecutive day. 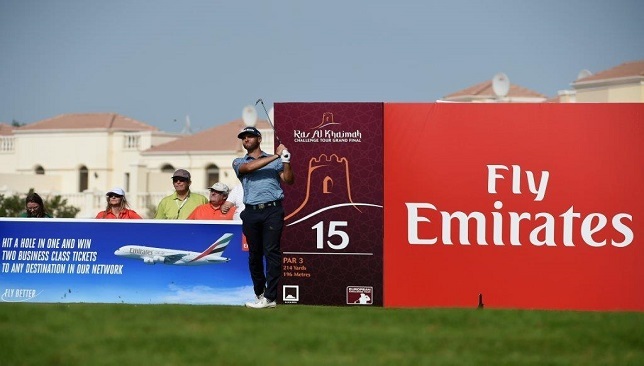 Arnaus, who is currently ranked ninth in the Road to Ras Al Khaimah in his first season as a professional, started his third round with a bang after picking up two shots in his first three holes before making his third birdie of the day at the eighth to make the turn in 33. The 24 year old then shot a back nine of 34 to put one hand on his first piece of European Challenge Tour silverware which could see him rise to second in the Rankings. “I am enjoying the week and everything has been working well,” said Arnaus. “It would be very special for me to win this tournament, overall it has been a great and fun year and to end it with a victory would be awesome. Daan Huizing, Victor Perez, Romain Langasque and Sean Crocker all share second place after a day of low scoring at the season-finale. Langasque started the week ranked 25th in the Road to Ras Al Khaimah but if the tournament were to end as it is, he would rise to 15th in the Rankings and seal the final coveted European Tour card for next season. “I feel like my game has been pretty solid this week but I seem to mess up one or two holes,” said the Frenchman. “It was difficult out there today due to the wind and the course was tough work so it’s hard to have a perfect round. Max Orrin carded a five under par 67 – the joint lowest round of the day – to rise from the bottom of the leaderboard to tied 29th. The Englishman is targeting a big final round after coming into the tournament in 16th on the Road to Ras Al Khaimah and on the cusp of promotion to the European Tour. “I’ve come into today with a fresh mindset and knowing that I needed two really low rounds to give myself a chance of finishing in the top 15 of the Rankings, “said Max Orrin. “ I played really well, hit some nice shots and holed some good putts which was a lot better than I’ve done the first two days. American Sean Crocker shot a spellbinding joint course record 64 which left him in a share of first place with Spaniard Adria Arnaus on the second day of the season-ending Ras Al Khaimah Challenge Tour Grand Final. 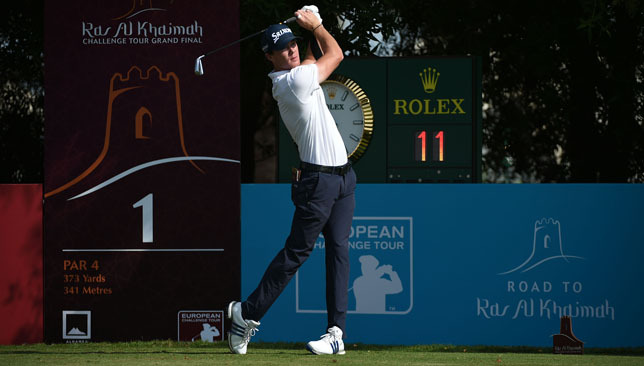 After making the turn in 31 with five birdies and one bogey, the 22-year-old Florida native carded a three-under par back nine which included an impressive eagle on the last to leave him on eight-under par after two rounds at Al Hamra Golf Club. Crocker further strengthens his chances of securing one of 15 coveted European Tour cards for next season after coming into the tournament in 14th place on the Road to Ras Al Khaimah. “My confidence has been high going into this week but there are also a lot of nerves because I’m right on the bubble,” said Crocker who made the cut at this year’s Open Championship. “After my first round I put a bit of pressure on myself because the boys below me were playing well but my game is good so I just have to go out and play this week because everybody here is an amazing player. Arnaus gave himself a chance of getting his hands on European Challenge Tour silverware for the first time after shooting 69 in the northern emirate to leave him tied with Crocker at the top. “I’ve played some solid golf and it’s been a lot of fun out there,” said Arnaus who has four top five-finishes to his name this season. Meanwhile, Portuguese Jose-Filipe Lima occupies third place with Frenchman Victor Perez, just one shot behind the leaders. Lima currently sits in 33rd place in the Rankings but a win in the northern emirate would guarantee his European Tour playing privileges for next season. 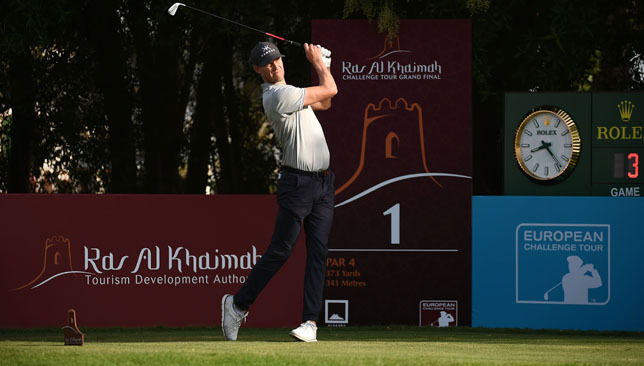 Niklas Lemke and Adria Arnaus carded rounds of six-under par to lead the way on day one of the season-ending Ras Al Khaimah Challenge Tour Grand Final at Al Hamra Golf Club. Swede Lemke, who currently sits in 37th place in the rainkings, came flying out of the blocks in round one as he made the turn in just 31 after picking up his first shot of the day of the par 5 third hole before sensationally making four consecutive birdies from the fifth to eighth. The 34-year-old backed up his remarkable front nine with one birdie and eights pars on the back nine to sign for a 66 and put him in the hunt for one of the 15 coveted European Tour cards available to the top-15 on the Road to Ras Al Khaimah Rankings following the tournament. Spaniard Arnaus, who has already confirmed his European Tour playing privileges for next season, struck five birdies and a stunning eagle on the par 5 14th to sign for a 66 in perfect conditions in the northern emirate.